What is an integrated dishwasher? Integrated dishwasher in the world of appliances means that you can mount a custom cabinet panel on your dishwasher. This way you will match surrounding cabinets and create a seamless finish. An integrated dishwasher is always flush mounted and will not stick out of cabinets. The term integrated dishwasher was imported from Europe. In the US most manufacturers use the term panel ready dishwasher instead of integrated. Here is the example of a "fully integrated" dishwasher. You will notice that dishwasher controls are at the top and hidden from the view. You also have the flexibility to choose a handle on the door to match other knobs and hardware in your kitchen. Bosch tends to make great dishwashers in this category. Watch our latest video on popular Bosch models below. Here is an other version of a fully integrated dishwasher. One that Miele makes without a handle for modern kitchens. Just gently knock on this "knock-to-open" dishwasher G6885SCViK2o to open its door. Appliance makers are not known for simplifying things for customers. 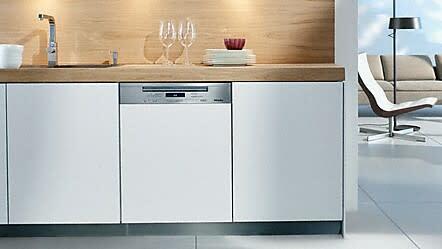 Therefore, they have introduced the paradigm for "semi-integrated" dishwashers. These dishwashers are able to accept a custom panel yet controls are visible. The Diamond Series G6935SCi is a flagship product for Miele with amazing features and semi-integrated look. Please view our comprehensive dishasher buying guide for additional tips on how to choose the perfect dishwasher for your home.